Esee make one of the most popular neck knives, the Izula. Let’s have a closer look. 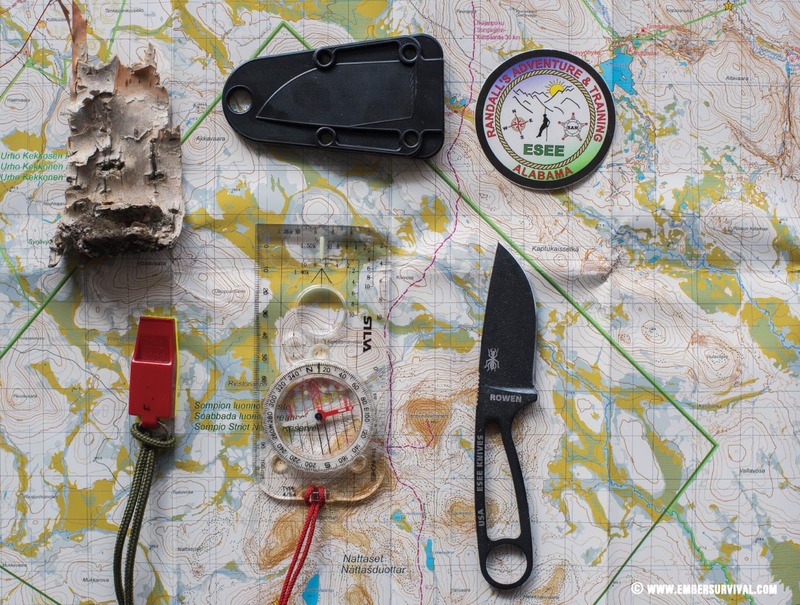 The weight of the Esee Izula is small and very manageable and when worn around the neck it doesn’t make itself known. Weighing in at 57g it is certainly lightweight. The size is subtle and unobtrusive. 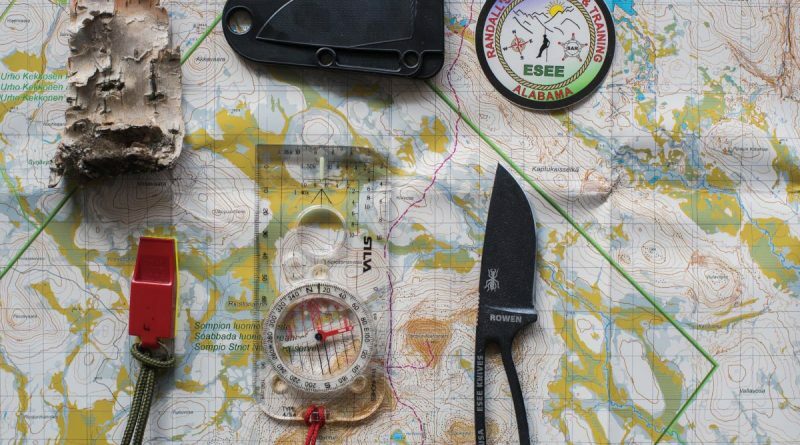 Esee Izula goes hand in hand with adventure and moving through landscape. 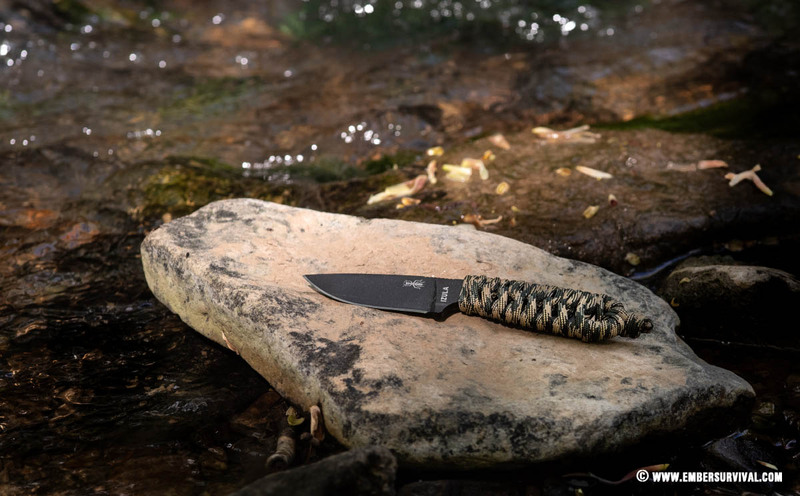 The Esee Izula comes in a wide selection of versions but for this review I will focus on the barebones model, the one supplied with a sheath and optional belt loop but without any handle scales. The blade metal is continuous through to the handle, it is a full tang knife. Esee Izula with paracord wrapped handle. 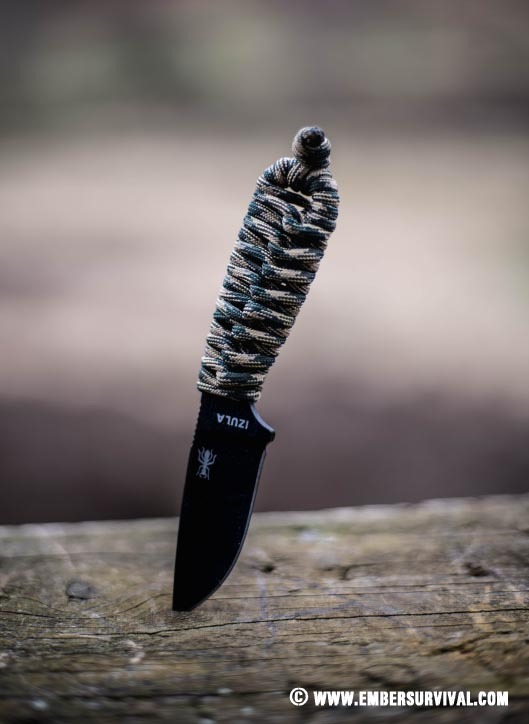 Adding some basic cord completely changes the feel of the grip in your hand and means you are never without paracord! The steel on this Esee Izula is 1095 Carbon Steel. It has a textured powder coat to prevent against excess corrosion but will still need maintenance in the field to prevent rusting. The grind is a full flat design. 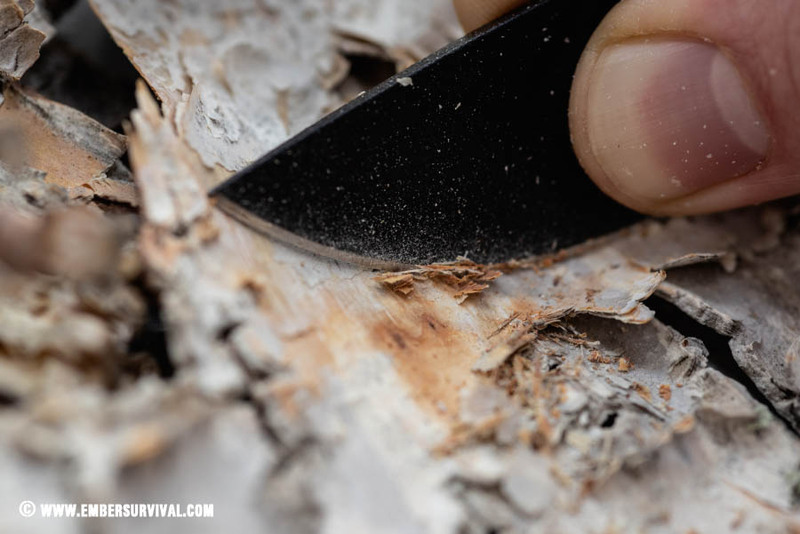 Using such a small neck knife, the Izula works best at fine tasks but as the blade is made of 1095 carbon steel it certainly packs a punch. 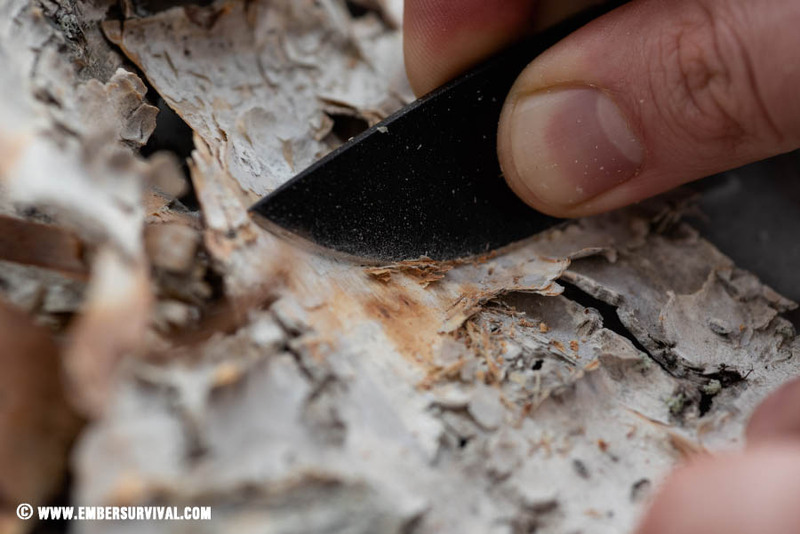 One of my favourite ways to use the Izula is to directly hold the sides of the blade and use it scrape tinder. The amount of control afforded by the dimensions of the knife make this task very easy to perform, especially when compared with a larger knife. Holding the sides of the blade allows you to exert fine control over the knife. Scraping fine dust for tinder is great with this knife. The carbon steel versions, like mine are coated in a texture powder to prevent excess corrosion. It is possible to remove just a small section on the spine to allow you to strike a firesteel however. Birch bark is one of natures greatest fire starters. Out the box the handle of the Izula is way too thin for my liking but adding a paracord wrap to the tang makes it feel completely different and I think more comfortable in the long run. 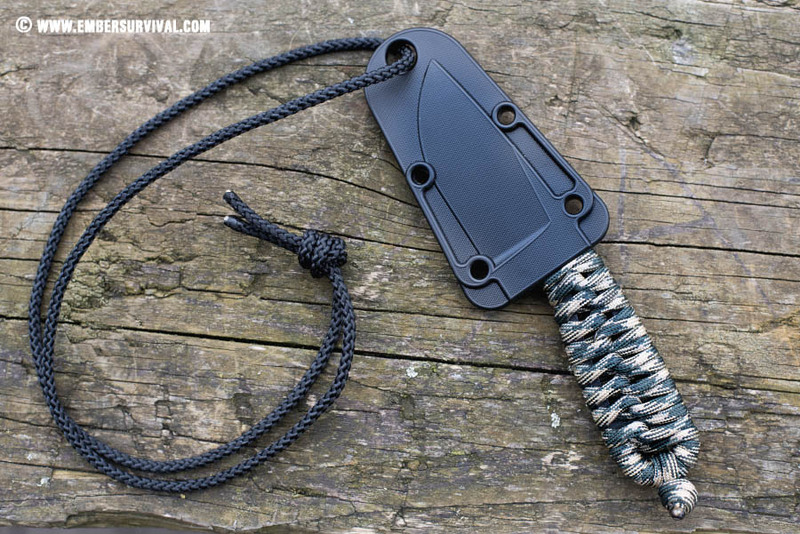 It does however make the knife larger in volume, so if you are using the Izula in a survival tin then you could always leave off the paracord if space is at a premium. Of course having cord with you is always handy. Esee Izula with paracord wrapped handle. An excellent companion in the woods. The sheath has a nice firm grasp and muted ‘click’ with the knife is pushed into the held position. You can use the pre fabricated holes in the sheath to attach a neck lanyard or the included belt loop accessory. It is made of a strong feeling plastic and there is no lock present on the sheath. 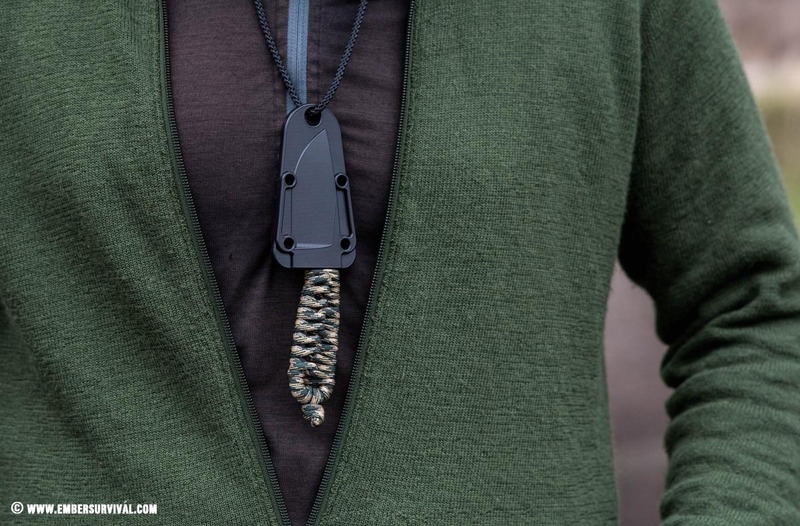 Wearing the Esee Izula around the neck is where it feels most at home. When using a neck loop it’s vital that the cord can be easily broken. Therefore the user is protected from strangling themselves by getting it hooked on a branch. Really handy knife that has a great variety of carry options. Steel holds a good edge but can rust if left untreated. The tang as a handle is unusable without a paracord wrap at the very least. However without any wrap to the handle the knife is very low profile and would fit easier inside survival tins for example. So this option is really down to the user. I use my neck knife often so a larger more comfortable handle makes sense to me. Sharpening the Izula can be done on a small whetstone such as a DC4 or my preferred method is to use a SpyderCO Sharpmaker. Using strong cord like this makes it dangerous to carry around the neck. Make sure you use a cord that can be broken easily to avoid strangulation! The blade geometry is very multifunctional and can handle challenging tasks. It is too thick at the spine to make a great chopping knife for vegetable prep but for peeling tasks it is great. The Esee Izula is one of the most versatile knives on the market. The plethora of options ranging from steels, sheaths and scales you can pick out your favourite with ease. I like the simplicity of the barebones Izula package as it allows the user to use imagination to customise it in an exact way.